Take away the uncertainty involved in running your live applications with actionable insights into your applications and infrastructure provided by Planit's monitoring solution. Have confidence in your applications' performance and availability. Planit’s cloud-based Application Monitoring platform enables you to optimise your customer’s user experience and manage the performance, availability and service levels of your applications all within a single location. Studies show that brand perception is negatively effected by slow response times. Ensure that you are the first to know about slowness on your site. Take a proactive approach to your applications' performance and quickly identify issues and trends by managing your customers' experience across networks, locations and devices. Gain in-depth insights into your applications' performance with deep-dive diagnostics for rapid identification of issues and bottlenecks to enable timely remediation. Gain valuable insights into your applications performance. Your users’ experience directly impacts your success. When services are delayed or interrupted, your company’s reputation is on the line, even when the problem lies in a third-party service provider or cloud platform. Planit's Cloud Monitoring Solution is powered by Dynatrace and allows you to focus on on what really matters: your users’ actual experience of every interaction, from any device, application and location. 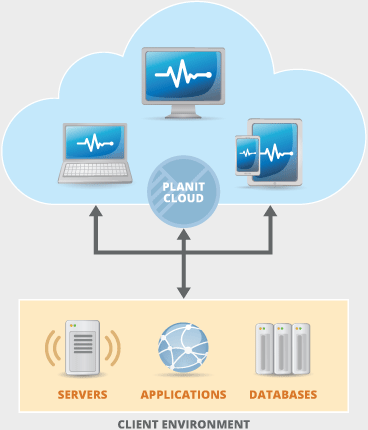 The Planit Cloud Platform supports both real user monitoring as well as synthetic monitoring. Provides an “outside-in” perspective of web, mobile and cloud application availability and service-levels. Identifies when key pages and transactions are slow or unavailable from multiple geographies around the world before customers are impacted. With PurePath® Technology, drill inline into transaction anomalies for faster problem resolution.